Cool and quiet weather will last through mid-week. A quick turnaround though will have mild temperatures and storms back by the weekend. Today and Tonight: High pressure behind the front that passed on Sunday will provide clearing skies and much cooler temperatures. Highs confined to the mid 50s, as the northwest wind of 10mph continues. Overnight will be clear and cold. 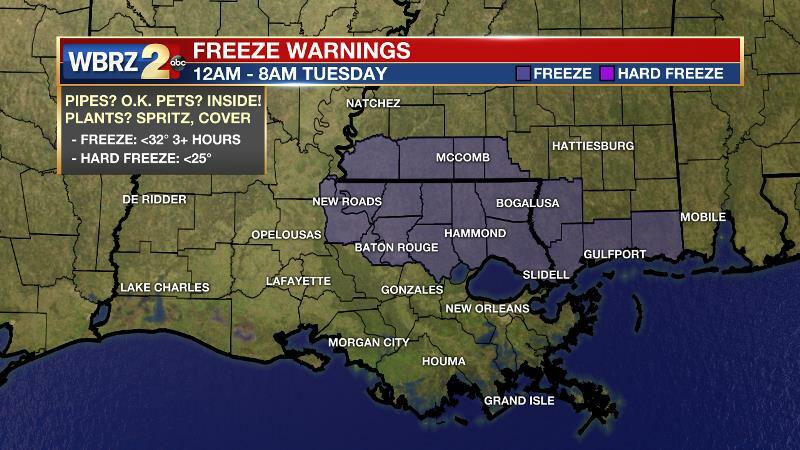 A FREEZE WARNING is in effect from 12am – 8am Tuesday for East Baton Rouge, West Baton Rouge, Livingston, Tangipahoa, Pointe Coupee, East Feliciana, West Feliciana, and St. Helena Parishes as well as Wilkinson, Amite and Pike Counties. Temperatures are expected to reach 32 or lower across most of the warning area for two to five hours. Sensitive vegetation could be damaged. Wind chill values in the mid to upper 20s will impact those outside for prolonged periods overnight tonight. Be sure people and pets have access to warmth and cover or relocate non-hardy plants. Up Next: The surface high will move from Texas to Mississippi between Tuesday and Thursday allowing for clear skies and gradual warming. Temperatures will break into the 60s on Wednesday, and then into the 70s on Thursday ahead of a frontal system. Winds will shift from northwest to the southwest, helping to increase dew points and rain chances beginning Thursday. As that system crosses the area Friday and Saturday, parameters could be favorable for strong to severe thunderstorms, so stay in touch with the forecast. The Tropics: With just under one week left in the official hurricane season, all is quiet. No development is expected in the Gulf of Mexico, Caribbean Sea or Atlantic Ocean. Into early Tuesday, most low to mid-level moisture and associated clouds will press east with a strong as a surface high builds into the lower Mississippi River Valley. Clear skies and calm winds will help temperatures plummet into the lower 30s along and north of the I-10/12 corridor early Tuesday morning. Widespread frost will be likely with temperatures at or below freezing for 2-5 in these areas. By midday Tuesday through Thursday, we begin a slow moderation of thermometers while remaining dry and calm. Focus will then shift to the next potential significant storm system developing across the Central U.S. late this week and into the weekend. Some forecast model guidance suggests rain and severe thunderstorm event in the region by Friday or Saturday. As usual, details will become more lucid as we get into the middle part of the week. Beyond this timeframe, there is no strong signal for a significant cool down, so seasonable to mild temperatures will likely continue.